The Adventure of Link is perhaps the most unique game in the Zelda series. Unlike the other Zelda games, The Adventure of Link features many traditional RPG elements, and is played mostly in a 2D side-scrolling perspective. The world of The Adventure of Link is split into two distinctive parts. A birds eye view overworld map exists, just like in the first Legend of Zelda game, but in The Adventure of Link it mostly serves as a small main hub, leading to the side scrolling areas. 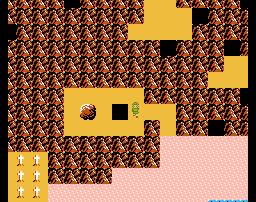 None of the action happens in the overworld, it is just used to travel from one place to another. Rather, side scrolling areas are where you spend most of your time in the game and every town, dungeon, and so on is explored through this perspective. Random battles are also used in the game, whenever you are walking through the overworld. When you enter a battle, you are taken to a side-scrolling screen where you will fight the enemies you encountered. The Adventure of Link operates on a traditional RPG system, but without the turn based battles. Defeating an enemy is played out just like any other Zelda game (except the side-scrolling of course), you use your sword, shield and so on to slay your foes. When you defeat an enemy, you are awarded with some experience points. These experience points can be used to upgrade your health, magic, and attack power. The game also operates on a life system - you will only truly die after you have lost all of your lives. This is something that no other Zelda game has adopted. Because The Adventure of Link is so different from the other Zelda games, it has inevitably sparked controversy. Some fans felt that the side-scrolling system and the RPG elements were alien to the original philosophy of the Zelda series. Others have criticised the difficulty. The Adventure of Link is a tough game, and in some areas you can't help but feel cheated rather than outplayed by the game. However, The Adventure of Link was not all bad. Numerous critics praised the game, including Nintendo Power who made The Adventure of Link their top game of 1988. 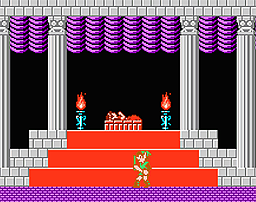 Some elements of The Adventure of Link have also been adopted (in small doses) in other Zelda games. Remember the side scrolling areas in Link's Awakening and the Oracles series? In any case, if you want a break from the traditional Zelda format, you should at least try out The Adventure of Link.